About three months ago, my sister discovered this beautiful 1955 Dodge Jobline pick-up truck in a local Charleston newspaper. 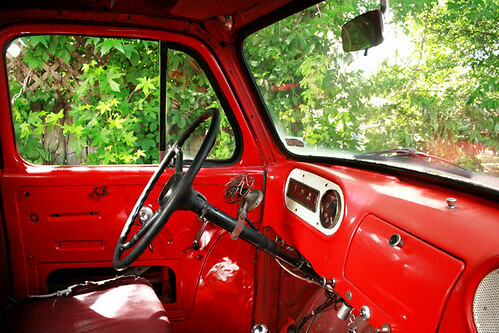 Knowing how much I'd always dreamed of owning a 1950's red pick-up, she rang to tell me about the listing and I located it online. We talked about how beautiful it was and of all the things we'd love to do with the truck, but the price was simply too high and over time, we soon forgot about her. Then, about two weeks ago, our Granny passed away and I found myself back in S.C. for her burial. One day shortly after, with emotions still at an all-time high, my sister and I decided we would go kayaking where our Granny and Grandpa were born and raised. It would've been a great trip, except none of the weather forecasters had predicted the severe thunderstorms that ensued and we quickly found ourselves in need of alternative plans. What better to do than shop, right? With our trip canceled, we found ourselves riding around Mt. Pleasant with a ridiculously large two-person kayak on our roof and "nothing" to do. I mentioned thinking it would be nice to go back and check out this 1960's “Endless Summer” type canary yellow station wagon we’d passed the day before, so we headed to the garage where it was parked. After perusing a wide array of vintage vehicles, we made out way to the garage and struck up a conversation with the mechanics. We inquired about some of the vintage vehicles and mentioned we’d found a red 1950’s red pick-up a few months back and asked if they’d ever seen one. They mentioned knowing of both a black and a white 1950's truck, but no red one. As the conversation neared the ½ hour mark, one of the mechanics remembered he’d seen a red 1950’s pick-up parked at a law firm not far from the shop. As soon as he said this I thought (and my sister claims I said out loud), “That’s it!”. Needless to say, I think we were all a little surprised. The owner - Christine - explained she'd moved to Charleston from NYC to get into the bakery business and had bought the truck to "pick up men" – yes, that’s why she’d gotten it. At this juncture, my sister looked like she'd seen a ghost. There were several reasons for this "ook". One being, she’d been born in NY and two, her sister (that'd be me) currently lives there. Thirdly, she'd been trying to figure out how to transition out of a career in radio and was thinking of starting a baking business! I'm not kidding. When she asked Christine if owning the truck had indeed helped her meet any men, she said it hadn't, but that the truck had been rented quite a few times for photo shoots and commercials. Gears in our heads quickly began turning. And Christine was so happy that women were calling about the truck because she specifically wanted to sell the truck to a female. She told us to go into the offices and get the keys to go for a spin. Jerking in-and-out-of all three gears, my sister finally stalled Big Red for a second time - sending us to a halting stop. Sweating and dirty, she screamed out in frustration, “Oh my God, I can't do this! We’re crazy! This is never going to work!”. Searching for the inspirational words an older sibling is supposed to have at the ready, I turned my head and spotted this white big rig parked just beside us and nearly fainted. For, it was a Cardinal line truck with no more than two cardinal emblems – one on the cab and one on the trailer - emblazoned upon it. You see, our Grandfather, who had died when we were very small was a country boy (related to Swamp Fox - yeah!) and his favorite bird was the cardinal. We know anytime one crosses our paths, to pay close attention. Gasping, I directed her attention right toward the “cardinal spotting” and we both nearly lost it. Tears welled up in both our eyes. My sister then took a deep breath and said, “Did you see the pair of cardinals fly past us as we drove back here?”. I hadn't and said so, but quickly grabbed my camera to capture the rig carrying the cardinal message from our Gran. While neither said so, in that moment, I think we both knew we'd buy the 1955 Dodge- even before we took her to get checked out. Can't go against the elders, right? We offered nearly half the original price and Christine accepted. So, if for any reason, you’re in need of a classic 1955 Dodge pick up truck in fire engine red, you know who to contact!